When current race car drivers are asked to name an all-time competitor who represents the best in motorsports, many would name the Brazilian Formula 1 champion Ayrton Senna. Driving Formula 1 cars for Toleman, Team Lotus, McLaren and Williams, it was his time with McLaren team where legend of Senna is cemented. With a Marboro-sponsored McLaren race car, Senna captured his three career World Championships. The final title coming in the 1991 season, Ayrton Senna won 7 races en route to the victorious honour. Constructed in the context of an unassembled model kit, one of the McLaren MP4/6 Formula 1 race cars Senna rode in that 1991 tour will be available at a German auction. The art piece was actually created back in 1992 by than art student Jay Burridge. Burridge, who had since creating the McLaren MP4/6 sculpture became a BBC television personality, requested and received the blessing from McLaren team principal Ron Dennis to create his artistic design from a series of previously-used carbon fiber pieces. After Senna's death at teh San Marino Grand Prix in 1994, Dennis and Burridge agreed to keep the sculpture in storage out of respect for the Brazilian driver. The art piece would not be exhibited again until 2004 where it was presented in a Ayrton Senna tribute at the Goodwood Festival of Speed. Carbon fiber body panels remains intact depicting the wear of Formula 1 competition. Due to current restrictions in tobacco advertising, the only modification done to the McLaren MP4/6 formula 1 car was the replacement of decals wearing the Marlboro name with the unnamed strobe decals. While a change to the particular race-used structure, the livery presentation is accurate to what was used in certain European events through the 1991 Formula 1 season. Both Britain and Germany had outlawed tobacco sponsorship in the 1980s requiring many Formula 1 race teams to adopt this camouflage. Former McLaren team manager Dennis Rushen commented on the piece saying,“I was really impressed with the Senna sculpture. Such a clever idea and it really stands out as something really different." Rushen also mentioned that Ayrton Senna would have appreciated the art piece saying that the Brazilian driver would often fly a remote-controlled helicopter at team meetings. Being a former race car once handled by legendary Formula 1 champion Ayrton Senna, this McLaren MP4/6 is given extra special prestige since its sale is an exception to a policy within the McLaren F1 race team. Typically after a grand prix event, McLaren F1 engineers dismantles a race car for examination and would either reuse or destroy any components. The sale of the Ayrton Senna McLaren Formula 1 car sculpture is a rare instant where parts from a race-used vehicle from the popular auto racing constructor will be available to the public. 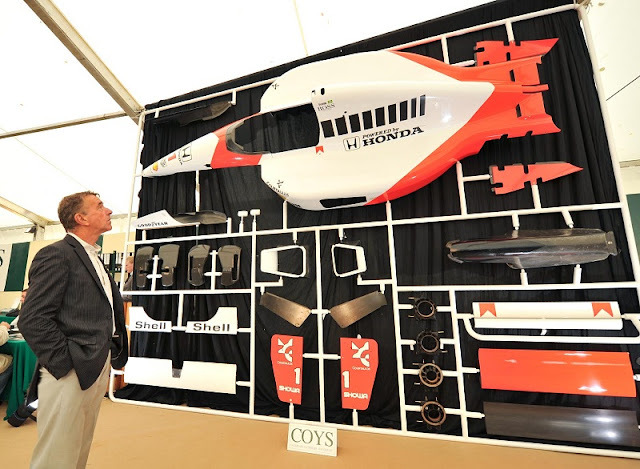 Listed as lot #112 in the catalogue for the Coys auction held in conjunction with the 39th Oldtimer Grand Prix at the Nurburgring in Germany, the Ayrton Senna McLaren MP4/6 model kit sculpture was previewed July 16th at Blenheim Palace in Oxfordshire. When the unique and historically significant item heads to auction on August 13th, Coys has estimated bidding as high as 50,000 Euros (about $71,500 US). With the career of the Brazilian racer being one of the most celebrated in motorsports, the value could go well north of that number. With whole crop of racers referring to Ayrton Senna as an inspiration, his legend is recently being fostered by a critically acclaimed documentary retelling the legacy of the three-time Formula 1 champion.